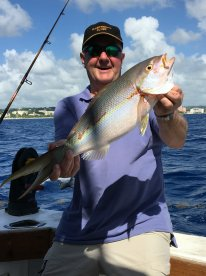 I have been fishing for years: I grew up as a spear fisherman and professional surfer and now I own and operate a successful surf school in Barbados. 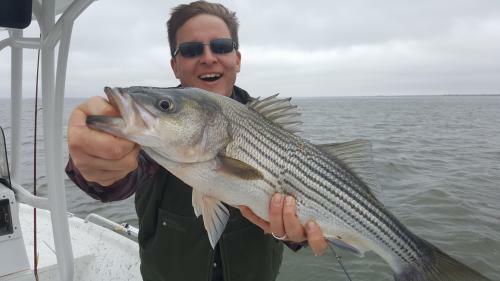 I started offering fishing trips as well as surfing a few years ago, partly because of the enjoyment it gives me, and also so that the guests staying at our apartments can get the taste of more adventurous activities. I like fishing for Wahoo and Mahi Mahi, either on the bar or offshore. Barracudas are fun too when the Wahoo aren't biting. I recently got into Marlin fishing and it is slowly taking over as my favourite. Had a great day on the water with Capt. Zed & Mario. Had a little fun with the “We are always on time” tagline. Things started slowly for our party of 6. Mario split us up into boys(2) v. girls(4) for the bragging rights competition. Capt Zed quietly informed me that it was rigged against the boys no matter what. Struck out early on the reef before changing up & heading to deeper water in search of some wahoo. Strike 2! But, the team switched things up again to find us some action. We had originally booked the Fish, Grill & Snorkel trip but our unanimous vote was to just keep fishing. Finally turned things around & had lots of Barracuda action to end the day. Had our fair share of misses but ended up with 7 keepers. Everybody got at least 1 including a nice 20+ pounder. Girls won 4-3. Mario did a fantastic job cleaning the fish mostly in the dark & we left with 20+ pounds of fillets. I think we ended up with 4 meals for 6 people (baked, grilled & fried) during the rest of our stay. Highly recommend this boat. Worked hard to find fish. And, kept us well hydrated & entertained with many fish stories. Thanks for a great day on the water! To begin captain Zed is awesome, he loves to fish and hunt fish, this is the most important quality in a captain. 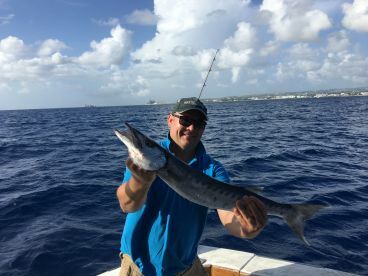 I sat on the flying bridge with him during the hunt and got a great deal of education about Barbados and fishing in Barbados, along with the strategy and technique of hunting Dorado, Wahoo, and Bill Fish. Theses guys worked their butts off for us, when we had the opportunity we hand lined Amberjack as the commercial fishermen do in the island. There are several ways to fish different things, if your serious about fishing and understand it ain’t always catch this is the guy for you. I encourage every serious angler out for the hunt to use Zed! He knows the waters, the fish and provides a truly enjoyable experience. His deck hands are also top notch, compitent, and great to conversate with. His guys busted a$$ all day long. And just an FYI Zed teaches surfing and has a great beach front place you can rent and stay for extended trips, if you want to really immerse yourself in the Barbados culture, stay at his place and rent a car or use the public transportation to explore the island. Another FYI they love Americans here, of all the places in the Caribbean Barbados is best. Also don’t be cheap these guys work hard tip them well! 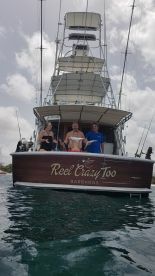 My husband and I and 2 friends spent a wonderful afternoon on board Reel Crazy. Capt Mario and his crew, Mario were absolutely terrific. They could not have been more accommodating. 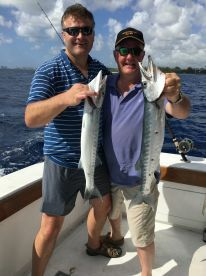 The fishing experience was fabulous and the meal of barracuda (that we caught) as the sun set was magical. The rum punches were the perfect compliment to a perfect day.